Home » Flooring » How Long Does It Take to Acclimate Hardwood Flooring? There is a common misconception among contractors that if you bring wood flooring into the workplace and let it sit for a few days, it will acclimate properly and be ready to install. This is a big mistake that costs flooring contractors time and money. According to the National Wood Flooring Association (NWFA), wood floor acclimation is “the process of adjusting (conditioning) the moisture content of wood flooring to the environment in which it is expected to perform”. Contrary to belief, it has less do with the amount of time you should let flooring sit to acclimate on the job site and more to do with monitoring the moisture content of various components. It is a fact that wood flooring will always perform best when the environment is controlled and remains within a relative humidity range of 30-50%. The temperature should also be controlled within a range of 60-80 degrees Fahrenheit. 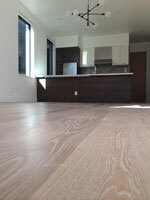 Wood flooring installation should always be the last job of any construction project. Certain conditions should be met before wood flooring is delivered to the job site. Make sure the job site is ready for the wood, and the wood is ready for the job site. Wet elements including plaster and paint should be completed and dry before the wood is delivered to the job site. They may not care now, but they will care six months or one year down the road when they have flooring problems…and those problems will be your problems to fix. Levon believes it’s important to educate your clients with useful information. As Levon mentioned, it’s always better to delay bringing in wood flooring materials if the walls were just painted or the subfloor isn’t completely dry. Wood flooring is hygroscopic, meaning it will naturally absorb moisture and change dimension. Wood will expand when it retains moisture and become smaller when it loses moisture. This definition is defined by the NWFA along with other useful resources. If acclimated wood flooring is delivered to a job site while the contractors are still painting, the wood flooring will absorb the moisture of the paint, increasing the moisture content of the wood. Solid strip wood flooring (less than 76 mm wide) that has been acclimated properly will not have more than a 4% moisture content difference between the flooring and the subfloor. For wider flooring (more than 76 mm wide) there should never be more than a 2% moisture content difference. Wider boards tend to have more movement issues than narrow boards. If the subfloor moisture measurement comes in at 7-10% (measuring with a properly calibrated wood moisture meter) and your hardwood measures in at 7-10%, it’s usually safe to assume the job site is ready for the wood and the wood is ready for the job site. If the job site is normalized to an in-use reading for your region and the subfloor and the wood flooring moisture (wood flooring less than 76 mm wide) is within 4 points of each other, the flooring is acclimated and ready for installation. Imported species or tropical species typically require more time to acclimate because of higher density and oil and resin content. It is highly recommended that you measure the moisture content of wood immediately after delivery to establish a baseline. The most efficient way you can record accurate wood moisture content and representation is to check and measure the moisture content of 40 boards for every 1,000 square feet. As the NWFA suggests, “Calculate what the optimal wood flooring moisture content is (baseline) by dividing the high season and the low season. Example: If your region has an expected EMC from a low of 6% to a high of 9%, the baseline moisture content of the wood would be 7.5%. Wagner Meters is the most respected moisture meter company in the world, providing flooring professionals with quality handheld devices that help establish a baseline and gather additional moisture measurements you can record and keep an eye on. 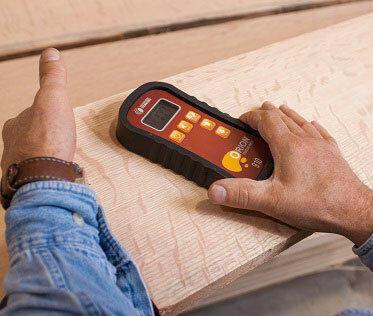 Wagner Meters carries various wood moisture meters and concrete moisture meters that take the guesswork out of the acclimation process by providing accurate moisture readings you can depend on. These meters are the most valuable instruments used in the acclimation process. They measure the moisture content of the subfloor, concrete and the moisture content of the wood flooring to be installed. These measurements will provide you with precise and accurate conditions that will help eliminate flooring failure if conditions are not suitable. Moisture measurements will also help you decide if the subfloor or concrete at the job site are dry enough to receive wood flooring. If the subfloor is too wet, moisture will be absorbed into wood flooring materials and flooring will expand and buckle. If flooring materials retain moisture at the time of installation, the flooring will shrink when equilibrium (EMC) has been reached, which will cause wide gaps and spaces in the flooring. These moisture content measurements are crucial if you have a problem with faulty flooring received from the manufacturer. The warranty of many manufacturers will be void if you can’t back up your work with solid evidence. Acclimation of wood flooring begins with proper storage at the job site. Wood floor acclimation can be achieved by cross-stacking and spacing wood floor materials to encourage air circulation around the boards. Most manufacturers recommend materials acclimate for a minimum of three days with no maximum suggested. In order to make a proper judgment call on how much time is needed to acclimate your wood flooring, you need to have a baseline and know what the moisture content of wood flooring is when it is delivered. It’s important that wood floor materials reach a moisture content that is in equilibrium with expected use. In order to accomplish this, it will take as long as it takes. Regular moisture readings will indicate when wood flooring has stabilized and it is in equilibrium (EMC) with its environment. At that point, no further changes will occur. Even with engineered flooring, it is suggested by some manufacturers that in order to retain coverage with the warranty, the job site has to be maintained between 30-50% relative humidity, and these conditions must also be maintained after installation. Floors perform well when you invest time during the installation process to ensure moisture, temperature and humidity are controlled and stabilized. Failure to properly initiate wood floor acclimation before installation begins may compromise the integrity of your floor. Excessive gaps, warping or cupping can occur after the installation is complete; the expansion joint may also be compromised, which will result in further damage. Failure to acclimate the flooring will also void the manufacturer’s warranty if such problems arise. When you take the time to prepare your job site location, bring it in at the right time, determine the expected seasonal change for your location, and make sure everything is acclimated correctly, you’ll never have a problem with hardwood flooring. Click here to decide which moisture meter is right for you. I’m beginning to believe that hardwood manufactors are drying the wood too much. I’m 3rd generation hardwood pro, been doing it everyday for over 20 years and I’m in the south so this may not be an issue in other parts of the country. We live and work in the south, our wood comes from the south. Here’s my theory. It seems that almost every hardwood delivery is under 3% moisture. In wide wood over 3 and 1/4 you will see cupping at 7% and under. Doing new construction you never really know where the house will settle after a complet season, if it’s an addition with hardwood existing it’s a lot easier to determine where you think it will settle. Its never guaranteed as new construction is a lot better than say 40 years ago, so a lot of time the new will hold less. Ok back to my theory manufactors are producing wood under 3% so if you deliver to a normal new construction site just the aculmation process is going to cause the boards to start cupping even before the instlation process begains. Say the house is going to hold around 8% (which is great if you live in GA) the 5% gain will defiently affect the floor. And if the wet Rainey, humid season hits just after the instlation or sanding process it can jump 3 to 4 points, I’ve personally seen 2 to 3% cause major headaches in floors over 4 inches in width No matter if it’s no more that a 3% difference between sub and your flooring when installed. I personally think the NWFA should hold manufacters in different parts of the country to different standrads, say in the south I don’t believe floors should be dried under at minum 5% Pretty much every house in the southeast is gonna hold around 7% or more, very few ocations will it hold less. So if it’s under 3 and climbs to 7 or say 9 your headed for a problem, your either going to fight it together( after its slightly cupped and the tongue and grove has actually swollen ) or put it in early and let it aclmate installed nailed to the floor which has its own problem areas( cupping and popping) so if it was dried down to around 5%, 2 to 3 % would be a lot less affected and could reasonably be aclimated in around a week. But natural products have a mind of there own sometimes. Curently sanding new 4 inch (builder installed his self) floor reads 7% but is cupped like crazy which is bad for people buying house sure to have issues with popping down the road. Sorry to ramble on but I’ll sum it up right here. I think the NWFA should set different standards for different regions in the south wood should probably not be dried under 5%, say out west in your dryer regions under 3 may be acceptable. But not in the south. I love the look of oak floors, and I plan on having it installed in the spring. I want it to be perfect, so it is important that the wood has time to acclimate. It’s very dry where I live, so I doubt the humidity would level would fall in the 30-60% range. Should I humidify my house before I order the timber? It is important to allow the flooring to equilibrate in the environment it will be installed. It’s even more important to maintain a constant level of humidity as much as possible. A moisture meter such as our Wagner MMC220 can measure every piece of flooring before installation to confirm even moisture content. Our TH-200 Thermo-Hygrometer monitors temperature and humidity. These two tools along with our free WoodH2O app are essential for a successful flooring installation. Please visit http://www.wagnermeters.com/wood-flooring/ for more info and free flooring articles. Larry, nice article with good information concerning MC, temp, and RH and other factors to consider before installing wood flooring. However, I do have a question as to which installation method is best to use after the MC, RH, and temp are at ideal conditions. My wife and I live in Houston, TX and live in a single story house built over a concrete slab. The house is 22 years old. Our indoor RH is ~50%-55%. We would like to replace the existing vinyl and carpet flooring throughout the house and was looking at engineering wood flooring or tiled flooring that looks like wood. We called various contractors and all seemed to offer up their own suggestion as to the type of installation regarding the wood flooring. Some say we should use a floating floor system, others want to build up the existing flooring ~ 1 1/2″ with wood underlayment and then nail in place, while others say go with glue. Assuming that the concrete slab is completely dry and can accept wood flooring which of the three methods (floating, nail in place, or glue down) would be best to use here in Houston, TX. Thanks for your time. Since this is more of an application question rather than moisture related, I will refer you to the National Wood Flooring Association (NWFA.org). They can answer this question. I think it’s unfortunate that most sellers of wood flooring do not make the customer fully aware of the preparation issues. We bought a very nice engineered floor, yet we are now into a full week and still not able to install. If we had known this we would have ordered it and had it delivered much sooner, thought we just needed to get it there and the installer would come and put it in. The contractor says he will not install until it’s ready and although it is a major inconvenience now, we will regret it soon after. I am looking forward to the new floor, just frustrated and worried that we may have purchased a defective product since it has been almost a week and acclimation is not complete. Do you know how long we would have to wait before we actually learned that the flooring is not going to get any better? Feeling frustrated. Thank you for all of the interesting information, wish I had seen this sooner! Your installer is doing the right thing. It is very important to let the flooring acclimate in its installation environment before installation. This allows the flooring to slightly expand/shrink as it adjusts to its new environment BEFORE it is installed. The unfinished red oak flooring that I purchased was delivered today in 20 square foot bundles. The wood was stacked in bundles in the rooms where they will be installed. 15 in one room 10 in another and 13 in another. My question is should I loosen the straps and spread out the wood (which would make quite a mess) or can I leave them to acclimate strapped in the bundles as they were delivered? In essence, the material will acclimate faster when all surfaces are exposed to the surrounding conditions. If the flooring is kept in bundles, pieces in the middle will not have that exposure. I’ve always wanted hardwood floors and this article convinced me even more than that’s what I want! I just bought a new home and I’m thinking about replacing all of the carpets with wood. I actually had no idea that wood floors could add value to a home. Thanks for the heads up! Solid hardwood floors come either unfinished or pre-finished. This type of wood flooring is solid all the way from top to bottom. Unfinished hardwoods are a bit inexpensive to purchase and it requires immediate sanding, optional staining, and sealing after installation, which will require you at least 48 hours for the sealant to dry. Thanks. Exactly what we were looking for.